Our community spirit is best exemplified by First Night ArtWorks!, our year-round arts outreach program culminating on New Year's Eve. We've engaged hundreds of young people and families who participated with professional artists in hands-on creative workshops in the visual, performing and multimedia arts at community sites around Monterey County. Our 2015/2016 theme "Art is the Next Peace | Connecting Communities" Posts for Peace and Justice featured outreach projects using art to promote non-violent resolutions to problems, such as gangs, bullying, and domestic violence, with a goal of connecting communities and building positive healthy attitudes. FNM presented the artwork completed this past year by youth and community members within this project at our annual New Year's Eve festival. Working with community leaders in Greenfield, First Night con nues to build community engagement coordinating programming at the Cultural Arts Center. Guitar, visual arts, traditonal dance classes are offered to youth. Computer tech classes are taught to adults and youth. In collaboration with the Hartnell College South County, ESL classes are taught to adults. The Center events include: Day of the Child, Day of the Dead, Las Posadas, art shows, free Mariachi guitar lessons with teacher Martin Castillo and other community building activities. Visit the GCAC website. Ramon Hernandez formed Azomali Aztec Dance group in 2009. The group started with Ramon's family members; today the group has 30 dancers. Ramon is teaching the dance classes at the GCAC Tuesday and Thursday evenings; classes are open to the public. The Union Indigena Group was formed in 2005 with Triqui indigenous communities from the Mexican state of Oaxaca living in Greenfield. They pass on their cultural, language and family values to the next generations. Presently they have meetings with dance, language and drumming at the GCAC on Fridays and Saturdays every other week. Arcoiris Cultural dance team was formed to reach out to the Greenfield community with the help of the Arts Council for Monterey County and First Night Monterey. Pilar Mendoza teaches folk, line and flamenco dancing for children. The dance group meets at GCAC Wednesday and Friday evenings. Free art camps for Middle School students are presented by FNM for eight weeks every summer. Activities include digital art, drawing, watercolor and painting using traditional mural techniques. Read more below. First Night Monterey artists conducted eight weeks of free art camp for Middle School students, held at the GCAC. Activities included digital art, drawing, watercolor and painting using traditional mural techniques. Activities included digital art, drawing, watercolor and painting. Each year the youth create one public art piece and this past summer they created a colorful and vibrant mural, "The Color of the Wind". The City of Greenfield and the Arts Council for Monterey sponsored the mural and workshops. 50 youth spent two weeks with four professional artists creating the image and painting the mural. 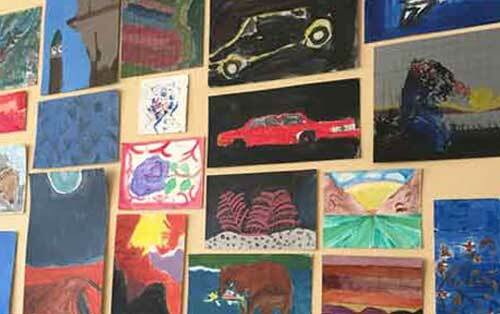 A year-round workshop meeting twice a month at the First Night Monterey art studio with community members of this Monterey County agency providing services and affordable housing to adult living with mental illness. Working on personal art projects with First Night artists, the group focused on drawing, painting and sculpting. They created a post for peace and justice, exploring their personal challenges with stigma. We engage the students into a creative competition to design the annual First Night Monterey Poster and Buttons. FNM artists work with the design students in Service Learning from theme concept to design for five weeks in class to selection of the final poster design. See last year's designs! Held on October 18th with over 5,000 attending, this free community arts festival produced by First Night Monterey and sponsoring organizations, celebrates the harvest and farming community. Activities included a community parade, 6 bands, 7 dance troupes, interactive art activities, pony rides, a petting zoo, a pumpkin patch and 55 vendors showcasing the many cultures and arts of Monterey County. First Night ArtWorks! introduced a fee-based Summer Art Day Camp at the Archer Park Community Center in 2010, and followed up with a Fall Break Art Camp, where drawing, painting, sculpture, photography, puppetry, mixed media, printmaking and performance art happened! FNM Staff are professional artists and teachers and our goal is to nurture creativity and enhance art skills in a non-competitive, safe, fun environment. Each Friday we have a performance or gallery exhibit of the work completed during the past week. Read More about Summer Day Camp. FNM’s Art Works! presents free year-round arts workshops to introduce the visual and performing arts to children and adults throughout Monterey County and makes their works an integral part of the region’s largest New Year’s arts celebration. These workshops encourage an active involvement in and love of the arts. Young people and their families participate in hands-on workshops conducted by artists/educators in the months leading up to First Night. Often, these workshops offer important enrichment programs for community organizations with whom we partner to offer the workshops. The creative workshops culminate in exhibits and/or performances that become part of the First Night Celebration and are exhibited in other public venues throughout the region, such as the Monterey Peninsula Airport Gallery, Sunset Center, The National Steinbeck Center and Mission Cultural Center for Latino Arts in San Francisco. These exhibits give voice to the viewpoints and philosophies of all our residents and illuminate the commonalities of our world views. Collaboration is woven into our philosophy of engaging both the artistic community and the greater community, bringing them together to enrich lives and promote understanding. We collaborate with approximately 50 artists, more than 20 schools and community and arts organizations, and hundreds of volunteers in order to be able to present our workshops and the Celebration. We also rely on many sponsors and donors in our community to be able to present these workshops and the celebration year after year. To become a Sponsor or Outreach Partner, call the First Night Office at 831 373-4478.